UPDATE: Contest has been opened up worldwide by the seller due to the strong enthusiasm! Yippee! A big thank you to Brooke for your support! WILL TRAVEL special event: I am featuring a few special travel items for review and giveaway that I was able to use on my trip with my three-year-old son and eight-year-old niece this summer. If you win, you'll have your items in time for December holiday travel or Christmas gifts! Giggle Junction is offering my readers a giveaway of an I Spy Bag! 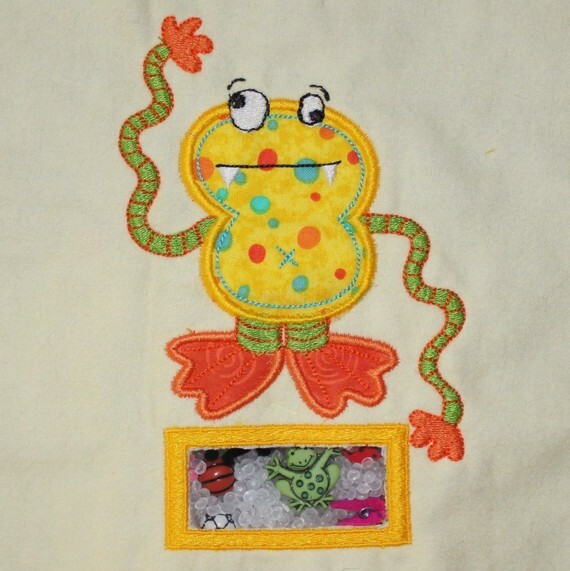 Giggle Junction is a fabulous Etsy shop that exclusively features hand-crafted I Spy Bags, a quiet, self-contained educational toy. 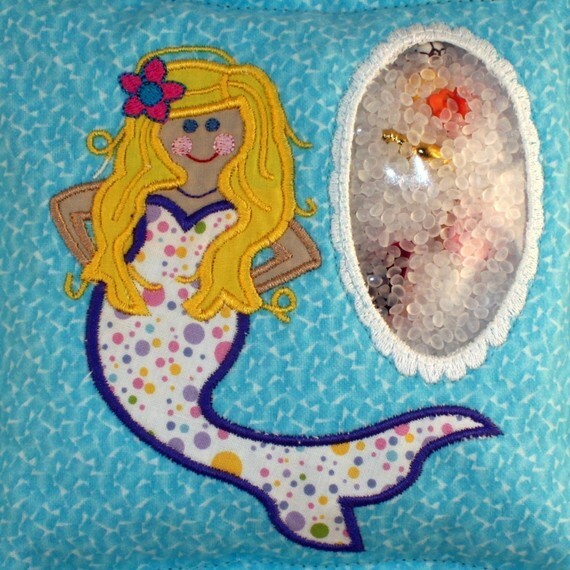 I had seen Giggle Junction's I Spy Bags and thought they were beautiful and intriguing, so I was so glad the owner agreed to let me bring one along on our trip to the beach this summer. It ended up being a really rainy vacation, so good thing we had clever entertainment like this! 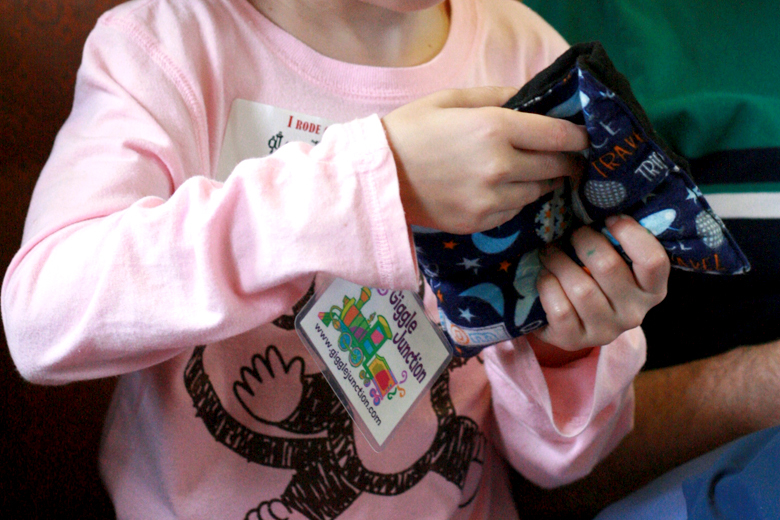 Giggle Junction's spy bags are like a small pillow that's actually a toy. They're made with soft flannel with a cute design on the front and a coordinating flannel back. The bags are secured inside then turned and top-stitched for added durability. There are 30 miniature objects hidden among the non-toxic plastic pellets that you can see through the spy window. They're just the right size for kids to hold and shift the pellets around until the hidden objects in the spy window reveal themselves. 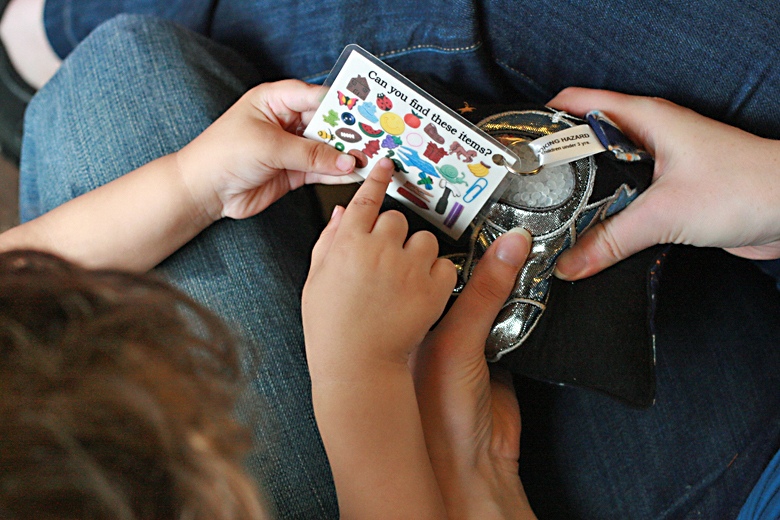 Kids can just enjoy what they discover, or they can try to search out the photographed objects on the back of the attached card that reveal what to look for. I like that it's a quiet and absorbing, tactile activity. It's perfect for an airplane or car ride, or waiting in a restaurant or doctor's office. 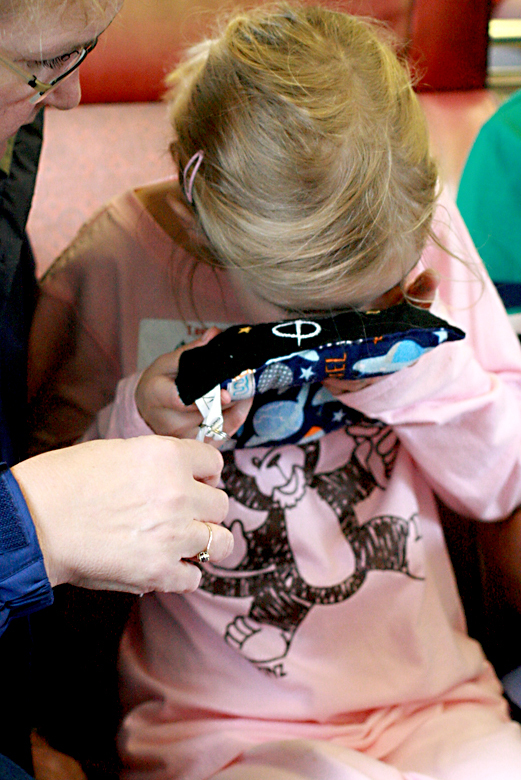 Younger children can choose a spy bag with a larger window, and older children might enjoy the challenge of a smaller window, so it's harder to find the objects. 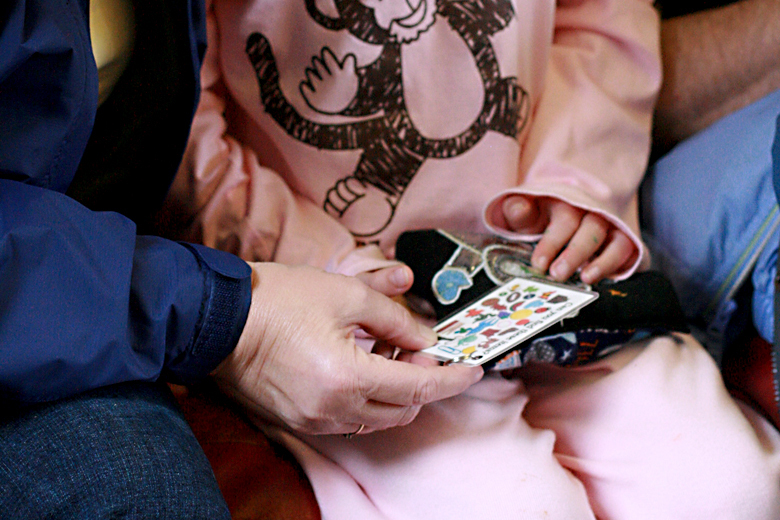 The spy bags can be used for toddlers on up, but use supervision around young children; even though it's unlikely that any small objects could somehow escape, they would pose a choking hazard if they did. Spy bags are washable if handled delicately. Carefully remove the laminated tag and either hand wash in warm water using mild soap and rinse or if your washing machine has a delicate setting you can throw it in there. Never use the dryer; always air dry. 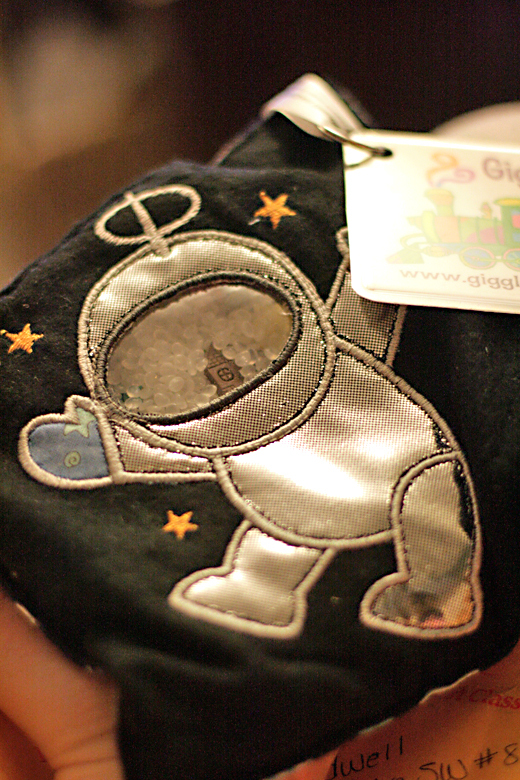 What I really love about Giggle Junction's I Spy Bags is the obvious care that went into making them. The soft and durable fabrics, the bold top-stitching, and the charming objects were all impressive. What I loved most of all, though, was seeing my son and then my niece happily engaged in their search. Truly, in this picture, both my mom and dad (my niece's grandparents) had gotten in on the search and were just as obsessed. Now that's a new method of searching! 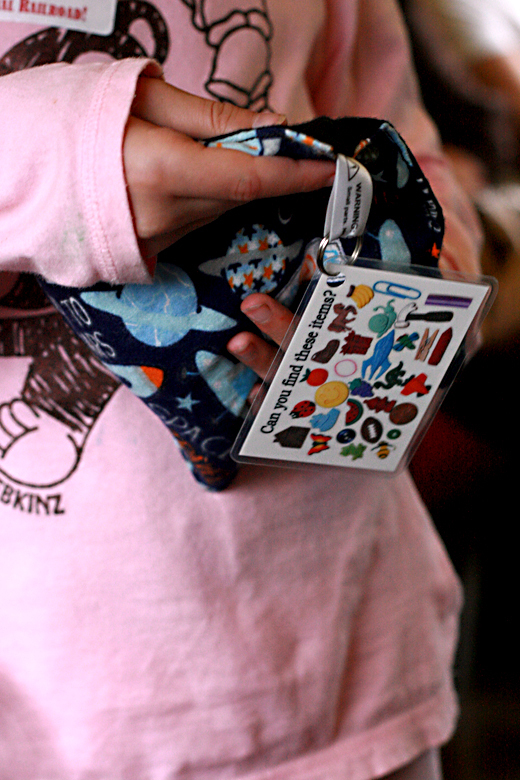 Giggle Junction points out you can also remove the laminated tag and suggest your little ones find, say, an orange object, or a square one, or one that starts with the letter K, to turn it into a different type of scavenger hunt and keep the I Spy Bag fresh. Older kids can even race each other to see who finds an object or all the objects first. They're good for pre-readers or children with communication difficulties, because the pictures make it easy to search for items. If you save this treat for just special occasions when you want some peaceful activity and mix up the way you interact with it, your kids will look forward to playing with the I Spy Bag every time. You can even personalize your I Spy Bag by having your child's name embroidered (for an extra fee) and the letters of the name hidden among the objects. If you email a picture, Giggle Junction can even crop it down to face shots and hide those in the bag as well. What a fun surprise! You can buy an I Spy Bag online from Giggle Junction's Etsy shop. The price for a single bag is $15. Shipping is $4 for U.S., $6 for Canada, and $9.50 elsewhere, so it's very reasonable for such a quality custom item. 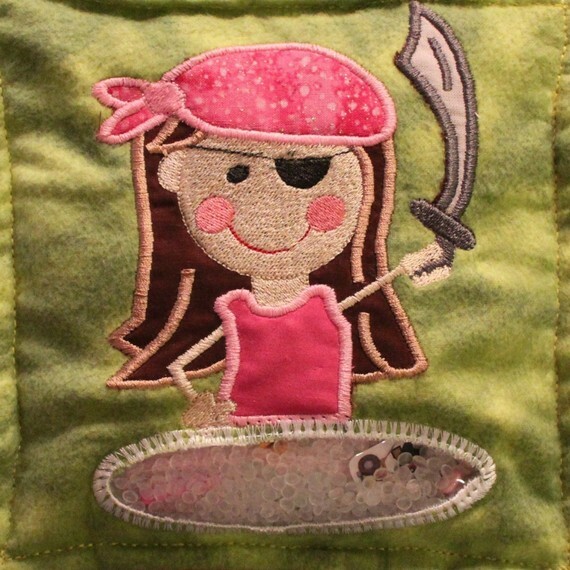 MAIN ENTRY: Visit Giggle Junction's Etsy shop and tell me which I Spy Bag you'd love to win! Heart the Giggle Junction shop on Etsy and leave me your Etsy user name in the comment. Heart your favorite Giggle Junction product on Etsy and leave me your Etsy user name in the comment. Let me know who would use this cute bag if you won. 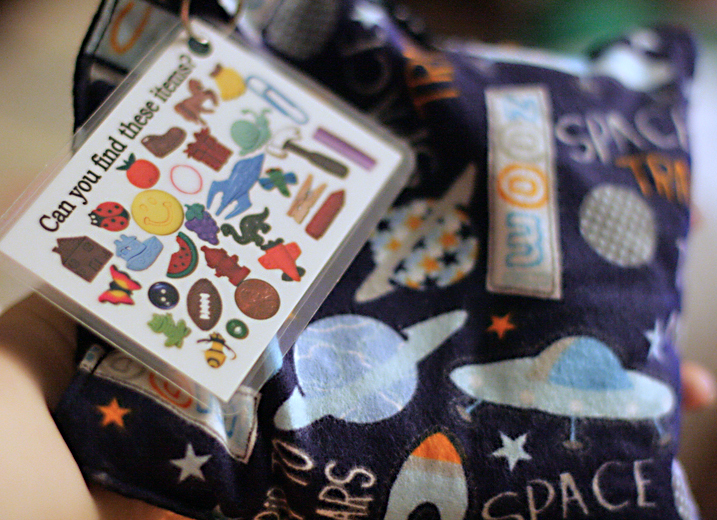 Disclosure: Giggle Junction sent me an I Spy Bag for review. What a great product! I'm not in the US so I can't enter the giveaway but I headed over to etsy and stocked up for Christmas (I let them know you sent me ;). Keep up the great reviews! Thanks. My boys would LOVE the fire truck set! 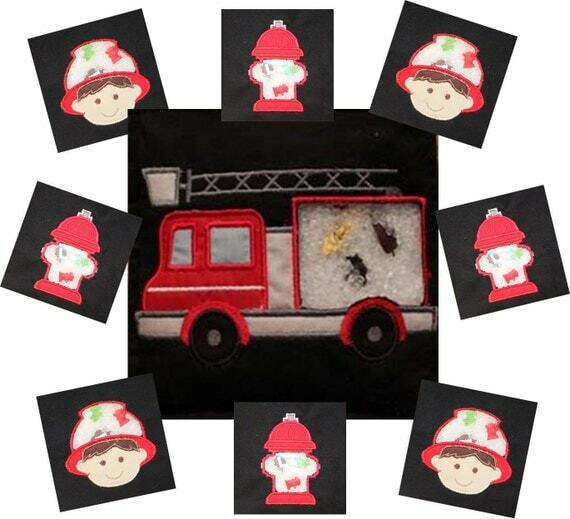 I would love to win the fire truck I spy bag, with out the 8 mini bags. My sister and brother in law are both fire fighters, and so my nephew is obsessed with all things fire trucks. It would make a perfect Christmas gift for him. I'd love to win the monster truck 4x4 one! These are sooo adorable and such a cute, practical idea! I would like the Wizard one! It's awesome. And I think it would be a great quiet toy for Margaret. My niece would use this adorable item! Will make a great xmas present. New Follower of HoboMama through Google Friend Connect. TURTLE - Hide and Seek Sensory - I Spy Bag - Toddler is my favorite. I would love to win the turtle. I love the astronaut bag but my nephew would want the Cars one. I love the "I Love You" one. So cute! This would be wonderful for my daughter. She has sensory processing disorder. I'd like the Penguin I Spy bag. I'd like the princess bag. This wouls be for my cutie pie granddaughter. if i won one of these, my son and nephew would play with it. but these would be great for my other nephew and neice as well.. can i win 4 please? I would give it to my almost-two-year-old daughter! I like the farm one! My son would love the dog I spy bag! He is in love with our dog and I think he'd love this product. My son is the biggest fan of firetrucks...he would LOVE it! I'd choose the Robot one! I would love to get the Turtle I Spy Bag. But it was so hard to choose! I have subscribed and verified via email to HoboMama. I would pick the princess Hide & Seek. I'd love to have the Turtle - Hide and Seek Sensory - I Spy Bag - Toddler. I "heart"ed Giggle Junction on etsy under username MagMom. I "heart"ed my favorite item on etsy under username MagMom. I'd give the I Spy Bag to my daughter. I'm a facebook fan of Natural Parents Network under username Jennie Tilson. My son would love the Dinosaurs bag. I like the bumblebee I spy bag! this is a fantastic idea- so unique and fun! i would like the robot bag. my 2 year old daughter would get this for christmas! natural parents rss feed subscriber. i have been looking at i spy bags and these are by far and away some of the best made that I have seen so far. I love the turtle on and the beach one as well. I adore the Robot, I spy bag. My little guys is obsessed with robots. I like the tropical fish bag. The horse one is cute! 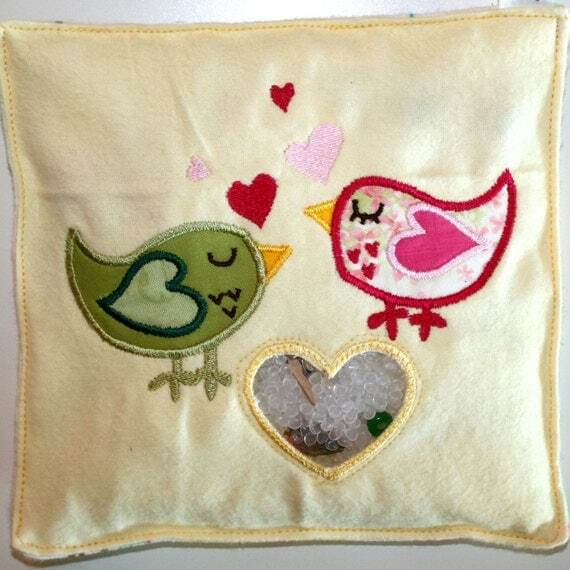 I'd have to say the Love Birds Sensory Bag, so adorable! I would love to win the TURTLE - Hide and Seek Sensory - I Spy Bag - Toddler. I love TURTLE - Hide and Seek Sensory - I Spy Bag - Toddler!!! Cutie!!! My little daughter would use this cute bag if I happily won!!! Subscribed to Natural Parents Network by email! I like Natural Parents Network on Facebook! Following Hobo Mama on Networked Blogs on Facebook! I think the Dragon and Dog I Spy bags are both very cute!